Friends of Red Mountain History Hike Series: Join the Friends of Red Mountain Park Sunday, May 18th at 2:00 p.m. for a FREE History Hike at the Park! This fun and informative hike series is perfect for families. Explore the Park’s beautiful trails, scenic overlooks and learn about the rich iron ore mining history that helped build our Magic City. American Hiking Society’s National Trails Day®: Red Mountain Park will be hosting a trail hike to celebrate National Trails Day® on Saturday, June 7 at 9 a.m. Enjoy a two-mile hike along Red Mountain’s most popular trail, the Ridge walk. Constructed completely by the hard work of our volunteers, this trail hike boasts beauty and history side by side atop Red Mountain. Summer Camps at Red Mountain Park:This summer the Park is hosting a variety of day camps and field trips that will provide educational activities while allowing children to explore, create and team build in a unique outdoor setting. 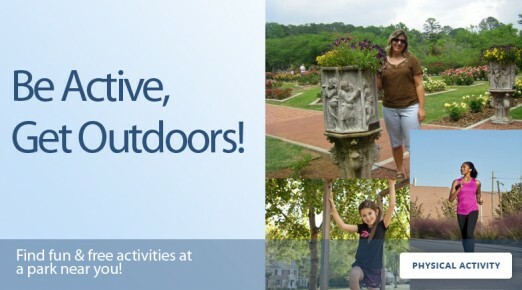 Family Yoga Class: Enjoy this unique opportunity for healthy fun with the family in the gardens. This energetic class will incorporate individual and partner yoga poses for strength and balance, plus breathing exercises to help foster calm and focus. Classes are every Saturday at 9 am through June 7, 2014. $15 per class. $5 for each additional family member. Ages 3 and up. Hikes for Tykes: Beginning at 10 am every Saturday, Hikes for Tykes is a free program provided to visitors of The Birmingham Botanical Gardens. This walk encourages pre-school children and their parents to engage in an outdoor educational adventure. March 18- DJ Slimm Rob’s Big Adventure: Put on your dancing shoes and prepare to move as DJ Slim Robb spins all of the greatest hits. Crunk Fitness: Hip-hop dance workout from 6-7pm every Monday. Zumba at Railroad Park! : Dance to your health on Wednesdays from 6-7pm. Yoga! at Railroad Park: Head over for some Yoga every Thursday from 6-7pm.